1st video down. It is eating the hillside. Probably going to need one of these...maybe even two. They keep saying that it might be the first time to "use the emergency spillway"...like they have a choice at that point. okay, I see that now. so it's racing towards the river, the fishery has been evacuated, what else is in harms way? It is eating the hillside. Is that the hillside - or the DAM? That is the hillside. The emergency spillway is even farther away from the dam. This shouldn't cause a problem unless the rain continues for a few days. Forecast was for 2/10th of an inch rain today. The problem with the emergency spill way is all the erosion, shrubs and trees that will hit the Feather River and jam with new channels starting. There is no control on the emergency spill way and it appears the damaged spill way is maxed out. How long can it last? Seems to have undercut up as well as moved concrete down. The damage is expanding and the incoming flow is still almost 3 times outgoing when last checked. So who is going to be the first to ride a barrel over the spill way with a go cam? Question for anyone in CA. Has Gov Moonbeam made any announcements or started any preps to help people downstream? Maybe he hasn't been disturbed from last nights hookah party? Emergency water supplies as well as National Guard to help guard evacuated areas is always a good start. Even some meals on wheels is always a help. LOL "You do not open the emergency spill way. At 901' it runs over the spillway. That is the top. Get it? The media was misleading. You do not open, close, or slow down the emergency spillway. The emergency spillway is the lowest point on the dam, where the water runs over the top first." Nothing valuble just a few thousand conservative republicans and probably poor liberals! "PGE buddy telling me there is water inside the dam." Been reading for years, just now starting to talk. From the local news: Even if the rains stops right now the run off from the upper streams and mountains will continue and they are expecting the lake to crest the emergency spillway around midnight tonight. All the local Oroville schools are closed today. Wife and I will be running down into Oroville later this afternoon so we'll see what there is to see, if that is even possible. In order to get into town we will be crossing the Feather River, if things haven't gotten too carried away by then. Youtube is full of videos across the earth documenting the catastrophes that follow appeals for calm, "nothing to see here', "we've got in under control", etc....all said in a hundred different languages and points in time. Those false assurances from authorities were always fairly reasonable assessments but always in hindsight we learn there was some critical bit of information they didn't have. The Dam's original controlled spillway system is a total loss and the thermal pond will require a decade-long re-dredging and reconstruction effort easily pushing $1B. The damage currently restricts managed outflow from 250K to around 65K CFS at the expense of severe, uncontrolled erosion. Those limits on outflow ensure that the uncontrolled emergency overflow will be activated by nature in the hours ahead. The simple fact that the dam operators have lost key control of outflow numbers is a red flag and should serve as a warning to those downstream. It doesn't mean the dam is going to burst but it does mean the dam operator has lost control of the dam just when the reservoir is reaching maximum design capacity. And this is just today, Fri. Feb.10....any significant rainfall in the weeks and months ahead is going to require vast releases also...either through the destroyed spillway system or emergency one at whatever flow rates nature decides. These erosion forces are going to be EXTREME and they're going to produce unexpected results. This is now a serious, serious situation. If I lived downstream, I'd be packing critical papers, getting provisions together and have a fully fueled vehicle ready to go at the drop of a hat. I'd stop work or whatever else and monitor reports closely, ideally realtime images of the spillway site itself. Anyways, if you live there...please take responsibility for your own safety and the safety of your neighbors where possible." Folks, how many times have we seen huge disasters where authorities waited too long and did not have viable evacuation plans? Katrina etc. Millions of ppl downstream, clueless. Just mention that there's some protected minnow in the water and the gov't will mobilize Army divisions to get this fixed pronto. Don't tell them people are in danger, just fish and frogs, they'll start moving then. That power line is looking to be at risk. Compounding evacuation problems are road closures due to flooding. When something like this is happening, it is wise to bug out BEFORE the floods, fires, avalanches, mobs, etc close the roads. it'll be interesting to see the rest of the damaged spillway, most of the photos are showing only the top undamaged portion. I think that is referring to the powerhouse built into the base of the dam. There appears to be a significant amount of backflow from the spillway, towards the front of the dam - and into the powerhouse. I was wondering about this, from one of the drone videos I saw it looks as if the water from the damaged spillway has carved a new path and is working it's way towards a power grid to the right of the dam. Unfortunately I don't know how to embed twitter video here, but a search on youtube might turn something up. I don't know if I want to laugh or cry reading this. But your right in your assessment when it comes to the gov't. YEP THERE ARE INFRASTRUCTURE PROBLEMS LIKE THIS ALL OVER THE USA! I was happy to hear of GW's "Shovel Ready" projects in 2008 getting funding to help after the economy went down. I was hoping things like the bridges back east that collapsed killing people would get fixed, freeways fixed, dams, freeway overpasses. 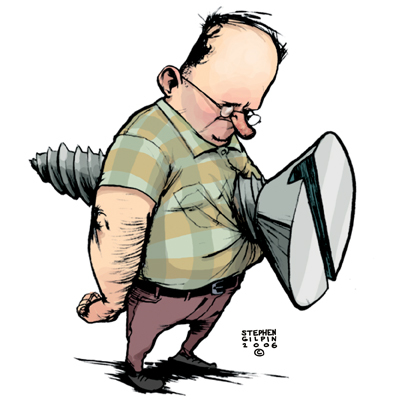 The problem is politicians >HATE< spending money on preventative maintenance. It doesn't garner them re-election votes the way a ribbon-cutting ceremony does with hundreds of then happy people, news media positive attention, pats on the back for doing this or that. This applies to private utilities as well. California's found out that Pacific Gas & Electric (PG&E) wasn't maintaining it's electrical or natural gas infrastructure (or even their infrastructure records) when several years ago a Natural Gas pipeline ruptured and blew-up in a residential neighborhood in a town south of San Francisco. Many people were incinerated, horrible. Packy I think this flow goes all the way to Sacramento. It needs a good flushing and might just get it. Cascadian is right on about there is no longer control over this Dam. It is totally in the hands of nature or you might get down on your knees and have a moment with the CREATOR. It is all going to happen when 901 feet is reached and that will not stop the incoming flow just start an overflow contingency that cannot be controlled. In other words Dam should be intact but will be empting via uncontrolled overflow. If 180,000 cfs is flowing in 180,000 cfs could try to flow out the emergency overflow. No one knows what will follow. The Dam operators are saying the 191 foot level will be reached by midnight. The middle of the night is no time to be bugging out. I would take advantage of the daylight and get what you can out of the way. If 180,000 cfs is flowing in 180,000 cfs could try to flow out the emergency overflow. No one knows what will follow. As I noted earlier, the emergency spillway sill is probably pegged into bedrock at the top of that hill. But bear in mind that it's never been tested, and it was almost certainly built by the same people whose main spillway has now broken apart. If the emergency spillway holds up, all we have to worry about is dirt and mess downstream. If the sill fails, then the sill level will almost instantly drop by what looks like six to eight feet to the ground level, if not more, and that is a honking big slug of water to send downstream. bw do you have any idea what the outflow of the emergency spill way is rated at. Inflows have been running in the 180,000cfs range. They seem to be dumping about 55,000cfs out of the damaged spill way for how long is anyone's guess. I think they have closed off the hydro spill due to back flooding. 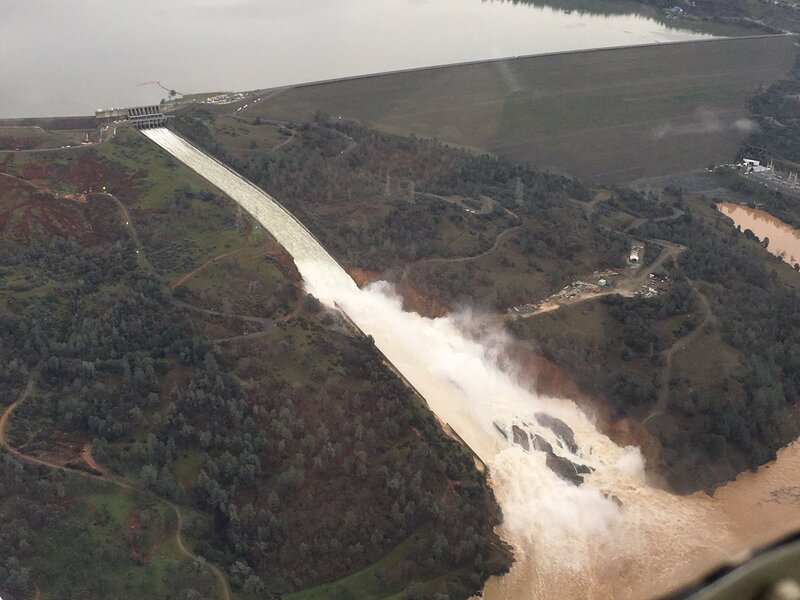 So the question is can the emergency spillway handle the difference of maybe 120,000cfs? If not water level behind dam continues to rise until something else gives. This is giving the benefit of the doubt they can continue to use the damaged spill way. I'd be evacuating if I was in the path of water if that dam was breached. All over the state roads are CLOSED due to mud slides. I'm looking at a graphic that shows road status in the greater San Fran - San Jose bay area. There are currently nine(9) road and highway closures due to mud slides. This whole area is ringed with mountains, the Coastal Santa Cruz mountains to the west and Calavaras Mountains to the east. The city of San Francisco itself was built on hills. You really don't get into significant flatland areas until you go eastward into the vast San Joaquin "valley" farming region. Even that area is bordered in the east by the massive Sierra Nevada Mountains. Lots of future Calif quakes caused by slipping faults from dry shrinking soil letting water percolating down to dry fault zones. 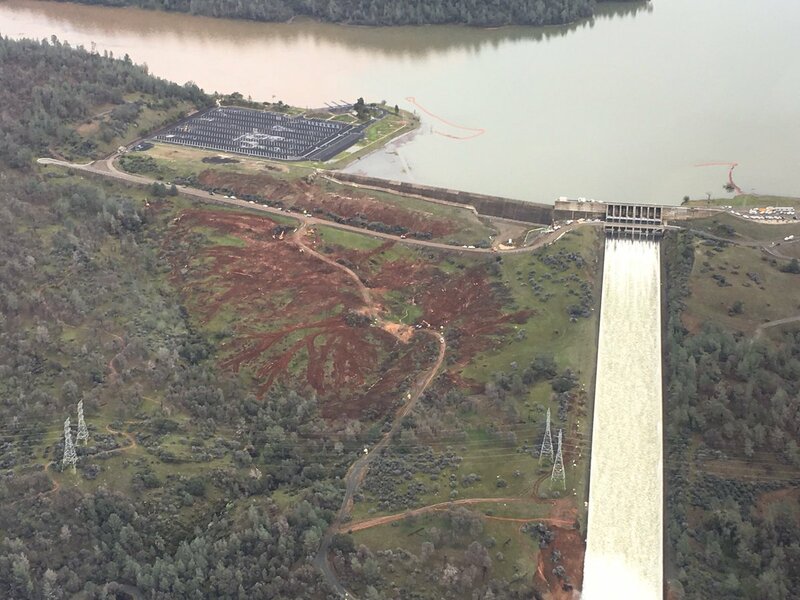 With all of the attention drawn to Lake Oroville, Murphy's Law dictates that now is a good time for people in California to keep one's head on a swivel. Add in mudslides, flooding, power outages, pipeline rupture, bridge failures or an ill timed earthquake and one problem can become many problems. When everybody looks in one direction it is always good to look in the other direction. Last night i remembered California legalized child prostitution which made child trafficking LEGAL and that Sacramento the state Capital is downstream if the dam ever bust wide open. The power of water is underestimated a bit too often. Living down river from a dam is like living next to a nuke plant, it's all good, till it's not. And usually that's a very quick reality. I suspect the people are smart enough to get out early. They are conservatives, not foolish brain dead liberals. The video shows how Orovile Dam was made. I was speaking of the overflow which has never been used , as they say. Ponder that in the wake of the dam situation and possible break. why would God want to kill off a bunch of conservatives? Wouldn't a great quake under the capital building make more sense?